Palm Harbor FL – Mortgage markets improved after the Federal Reserve released its March 16, 2010 meeting minutes. It’s good news for in Palm Harbor FL home buyers and rate shoppers everywhere or Palm Harbor home sales would have been much worse this winter– rates could have just as easily gone the other way. The Fed Minutes is a detailed recap of the debate and discussion that shapes the nation’s monetary policy. The notes are dense; it takes 3 weeks to compile them for publication. 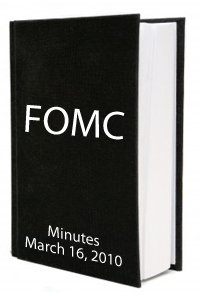 If the press release is the executive summary, the Fed Minutes are the novel. The extra words matter. The minutes recount what the Fed did, how the Fed did it, and what the Fed plans to do next. And, in the minutes, Wall Street looks for clues. This is why the report is important to every rate shopper in Palm Harbor FL and around the country. When the Federal Reserve publishes the minutes from its meetings, it leave clues about the groups next policy-making steps. For example, in March’s Fed Minutes, it’s clear that the Fed’s concern about inflation is hugely diminished and that’s a major plus for the mortgage bond market. Inflation causes mortgage rates to rise. The absence of inflation, therefore, helps them to fall. This improves home affordability, among other things. Similarly, the Fed Minutes note that real estate sales may have been worse throughout the winter months if not for low mortgage rates and the sense among Americans that home prices were troughing. We may infer, therefore, that rising rates may suppress home sales later this year. Markets are always looking for clues from inside the Fed and the last meeting’s minute signal that the economy is on its way up. If you’re looking for a bargain in the Palm Harbor FL housing market, your window to act may be closing. Ask us for a Market Survey for Your Property – Find Out What Your Palm Harbor FL Property is Worth Today. Your Palm Harbor Realtors – living and working here just like you. Passionate about being your local real estate advocate. We’re committed to delivering Results daily based on Integrity, Knowledge & Experience – helping you find the perfect Palm Harbor FL homes for sale. We’d like to be YOUR Palm Harbor FL Real Estate Team! Wonderful explanation! The markets are always trying to read between the lines of what the FED says. Another slightly off topic issue with inflation deals with the question I always get from borrowers is…”will you sell my loan over and over again?” After telling them that the terms of their loan will never change, I remind them that due to inflation that 5% rate they are paying loses it value over time. Nobody wants to sit on a fixed rate return over 30 years as inflation significantly eats into that 5% return.